I have loved plants all of my life. For a large portion of it, that meant indoor plants. Now that I have a largish property, it means lots and lots of garden beds with perennials. I don’t have much time to tend indoor plants, but I still like to have a few of them around. They brighten up the house so much. Last fall, I was shopping at Home Depot in the gardening center and had a look at the houseplants. They had a lovely Bromeliad – Aechmea Fasciata in flower and I fell in love with it. I did not think the flower would last long, bug for $16.99, I just had to have it. 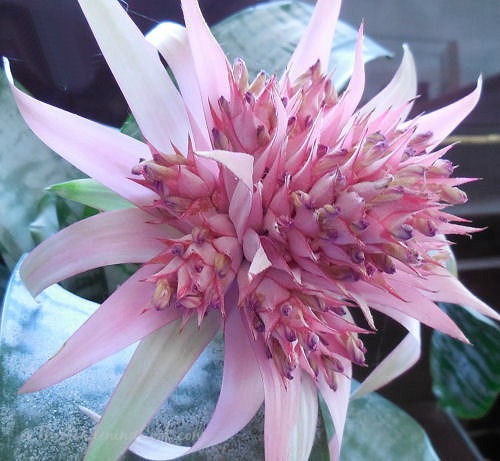 If you love to grow flowering houseplants with spectacular flowers, you can get a better plant than this bromeliad. Now, 6 MONTHS later, the darn thing is still blooming. How about that sort of bang for your buck. And not only is it still flowering but the bloom is setting off tiny babies around the center blossom, so I think it will be going for a while yet! When I first got the plant, the flower was so incredible that I kept tugging on it to make sure it was real! It is that beautiful. But no matter how hard I tug, it is part of the plant, much to my joy. If it were not enough that the flowers are so pretty, so are the leaves. My specimen has lightly variegated and striated leaves that are very large. They start out green and then get the extra coloring. 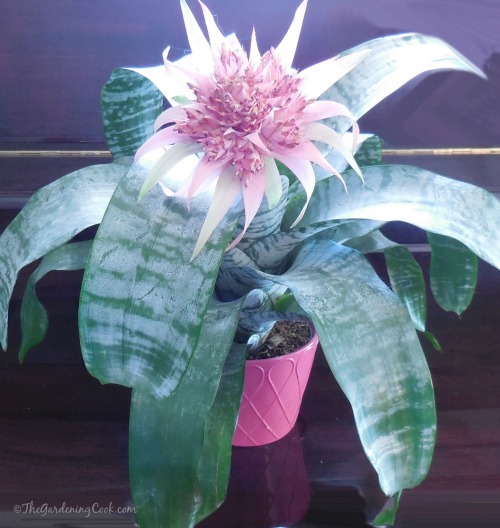 The plant name of this delightful beauty is Bromeliad – Aechmea Fasciata. It is originally from tropical regions of Central and South America. It is very easy to care for but not necessarily easy to get it to bloom. Light: The plant likes bright filtered light. I have had it in my home in several locations, from a north facing window with an eave overhang, to a fairly dark room and also close to a south facing window but not in direct sunlight. My experience is that the NC sun is too harsh for bromeliads, so I am careful not to give it too much sunlight. Watering: I water it about once a week, when it is dry about 1 inch down in the soil. It’s very happy with this and will take a bit of drying out as well, if I forget to water it. It needs more water in the summer months though. Brown leaf tips are a sign that the plant is being left until it is too dry. They also do well if the humidity is high, which is the main thing which our homes have a problem with, unfortunately. Weight: Because of the nature of the flower, these plants are quite top heavy, so be careful where it is situated or you will have water all over your table if it topples over! Temperatures: Aechmeas like temps in the 65-75º range the best. Definitely do not let it go below 32ºF. They cannot take frosts. Propagation: The plant will send out “pups” at the base. Remove the pups and plant them in well draining soil in bright light with warm temperatures. Patience is required. It takes about 2 years for a plant to flower from a pup. 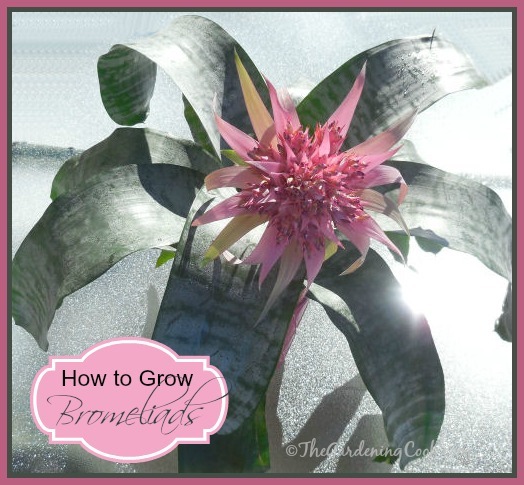 Have you tried growing Bromeliads? What varieties do well for you? Please leave your comments below. My pleasure Norman. Thanks for your interest in my blog. 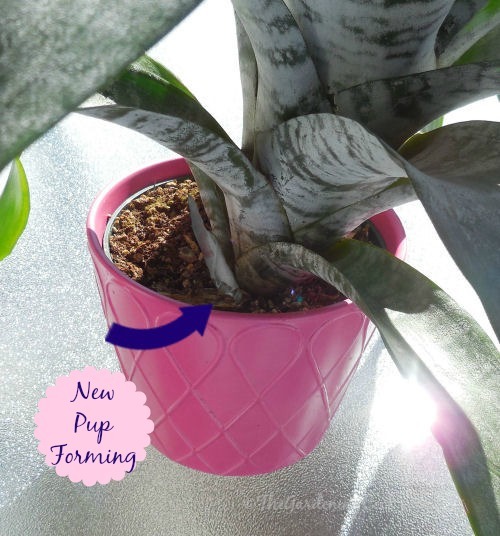 Hi, I have an Aechmea that produced 3 pups that are ready to be re-potted. Since they have no root system when you remove them from their mother, can you place in water for the root system to form or should you put them directly into soil? First off i bought one too about 3 months ago and im still in awe over its beauty and resilience! I have one pup but when the pink flower eventually dies do you loose the whole plant or do you just cut the flower?will the blant bloom again? Mine has not rebloomed indoors. They do outside if you have the climate for it (9 or 10). I have one big pup. I am going to separate it and repot it so I have two plants. That one should bloom and I can watch the other to see if it will too eventually. I did not remove the pups, I got 2 after the bloom, it took 2years to rebloom, but now all 3 are Blooming, and they are just beautiful! Totally worth the wait, I love in Florida, so I leave mine outside all year round on the front porch under the roof. Hi Debra. It depends on whether the flower stalk is brown or the actual leaves of the plant. 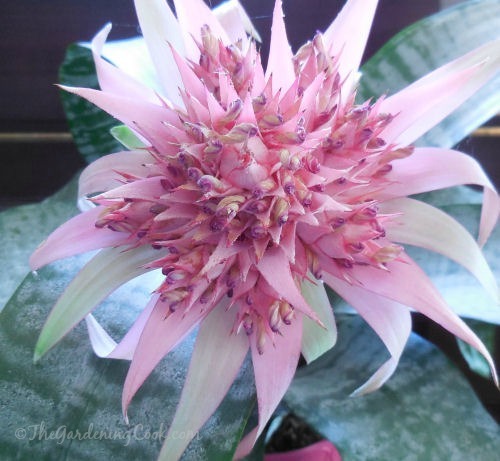 Most bromeliads, indoors, only bloom once and then the flower stalk and head turns brown. If you cut that off, it may send up new pups below.